For Sepia Saturday this week one of the themes was "strange compositions" such as things in the way. I chose this photo because there was a ladder on the side of the building and horses all in front. They are kind of blocking the actual building. Maybe they actually enhance the composition! I even see a small person there who doesn't seem to be looking. "This is a small, very faded photo, from colonial New Zealand which is unidentified. It could be an old accommodation house (judging by the amount of horses outside), or maybe a homestead for one of the sheep runs, or a general run-of-the-mill farm house. I am not an expert on colonial houses of this era, by the way but I'm guessing it is from about 1870s-1880s. My ancestor Jabez Lord lived next to an accommodation house called Watson's Accommodation House on the West Coast Road (now called the Old West Coast Road), not far from the Waimakariri River in Courtenay, Canterbury. Whether it is this house, I can't say. I also don't have a picture of Jabez's farmhouse in Courtenay. The Courtenay area, however, was known as a desert with not many trees at all and mainly tussock and harakeke or just bare land. Some tussocks were so high that children where tied to them by mothers while they were working, so they would not get lost! This photo has no trees near it. Tick! The fact all the horses are in front, could have been to show the wealth of the farmer. Maybe this photo was sent back to relatives overseas who were much poorer? I'm guessing and guessing again." "There is a twist in this story. This photo was in a German photo album. The album was likely brought out on the ship Sebastopol to New Zealand in 1863 and was filled with photos once in NZ. I know it is German as it is coming apart, and inside the leather binding it is lined with ancient German newspapers. My German ancestors lived on the opposite side of the Waimakariri River to the Lord family. They lived a fairly humble life and I'm pretty sure never owned a place so big. 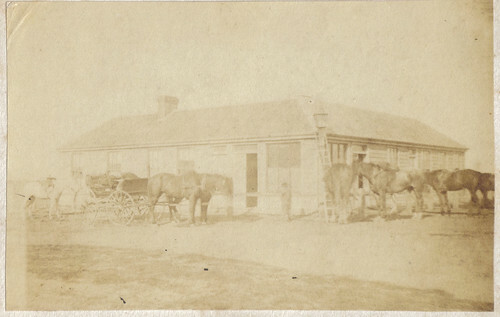 I do have a picture of their main family farmhouse and it is two storey. They also lived away from the major accommodation houses." "However it gets more confusing. My German ancestor Karl Meng lost his first German wife and married English born widow, Sarah Potts who lived in Courtenay at one stage and knew my Lord ancestors. She would have been near all the accommodation houses in the area - true icons - on the road that took men to the West Coast of the South Island, and the gold diggings. Sarah married Karl in 1882 and I'm certain took over the family photo albums. The German album has portraits sent from England, all unnamed, but likely belonging to Sarah." Does anyone recognise the style of these houses and where they may come from c. 1870s? 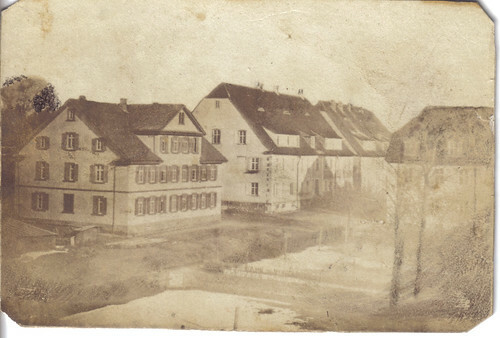 "The houses have a European appearance, but the photo doesn't belong to either of the villages my German ancestors came from. We are not sure where it is situated as there is nothing on the back of the photo. If anyone can shed light on the style of house and where it may come from, I would appreciate this. There is snow on the ground, but the snow has already melted from the roofs. The houses are far too tall and grand for the poor little villages that my ancestors escaped from, named Friedelsheim and Hohen-Sülzen, which I visited three years ago. Many people used to live in one or two tiny rooms. They also struggled to get enough food to survive. They were desperate to escape to New Zealand, America, anywhere really! Most of their houses were one level or sometimes two levels. These have four levels and multiple chimneys as well. Could they be a hospital or some other institution? Or are they in a major city, or a suburb of wealth? The composition is excellent in this photo but it is unclear what we are meant to be focusing on? Is it a particular building or the snow itself, or just the general scene? It seems the photographer has taken the photo from an upstairs window in another building as it seems to be looking down at the scene from a height. Whatever it is trying to show, there is an echo of another mysterious land coming out of the photo, and I bet the sender had a fascinating story to go with it, which will now never be uncovered. The photos in the German photo album are amazing (I think) and I will post more in the future; a mix of different cultures and periods of time." The horses do enhance the composition of the first photo, or at least make it look more interesting. Yes, I'm afraid I didn't have any interesting badly composed photos in my collection. I guess that's a good problem to have. Never say Never when it comes to Genealogy. Amazing things can turn up when least expected.. Having photos long term on the internet is essential with family names and places attached. ? Have you a site on Flickr for your unidentified photos. As long as they always have possible names and places as tags then some day someone searching them will find you. You probably know all this but it has served me well in most unexpected ways ! Yes boundforoz I have had some AMAZING things turn up because I posted information online. Some ancient letters turned up from the 1860s and 1870s for example. Totally amazing. I have some photos on Flickr but most of them are on my blog anyway. I'm slowly getting more on my blog and Sepia Saturday has been a great kick up the bum for posting them. I love it! I would recognise that second photo as Germany immediately from the style of the building at the left - very similar to a hotel we stayed in 2002. I suspect they are from Germany Bob. Thanks for your comment. I am guessing I will never figure out what town or city they are in though! Great old photos and a great story to match. Good luck solving your mystery. It always amazes me when I see how people lived "back in the day". Nice post. I agree that the horses make this photo. As you say that album is one to treasure.